First of all, I'd like to thank all of our donors and team members for participating in this year's Extra Life charity marathon. The Co-Optimus community and staff continue to impress me with their desire to give to those who need it, and for that I am very thankful. Together, our team has raised $2,038 so far. We're still accepting donations until December 31, so there's still time to get your tax deductible donation in, and to help us reach our team goal of $2,500. 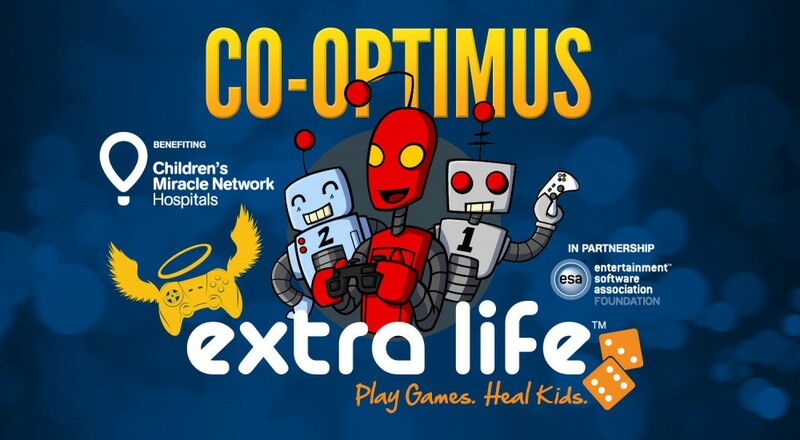 This year, Extra Life as a whole has been an incredible roller coaster full of ups and downs. Before the official marathon even started, the event raised over $2 million, breaking last year's total. On the day of the event (Nov. 2), Extra Life's website suffered several outages because some $&#%ing jerk decided to launch several DDoS attacks on it. Despite the crippling attacks, spirits were high, and Extra Lifers raised $3.8 million by Monday morning. The news of the attacks hit several news outlets, which caused a substantial number of new members to register, and resulted in the largest make-up day in Extra Life's history raising over $100,000. In the last email that went out to participants, Doc said we're just $39,000 from breaking $4 million raised. Remember, all that money is going to local Children's Miracle Network Hospitals to help sick and injured kids. It feels so good to be one of the thousands of gamers who did that. With this year's event nearly in the bag, I'm looking forward to next year. If you have any feedback on this year's event, please email me, or leave a comment on this article. If you'd like to participate next year, let me know, and I'll add you to my list. Thanks again to everyone who participated or donated this year!